The Perth winter is in full swing, and that means the rainiest season of the year. While you’re no doubt grateful that the blistering temperatures of Perth’s summer are well behind, your roof will now have to deal with increased rain. While it’s rare you’ll have to deal with torrential floods or hailstorms, water damage tends to be gradual and patient, and the increased humidity of the season will ensure that pooled water stays on your roof for longer. 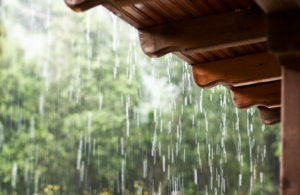 While rainstorms may be a relaxing alternative to the Perth summer, keep in mind that there are some things to check for after the rain to keep your Perth roofing in top shape. You’ll want to check your roof for cracks and holes before rainfall hits, if you have the time to do so. Perth roofing can be susceptible to cracks caused by the sheer heat of the Australian summer, with temperatures swelling up to 32 degrees Celsius. As such, you’ll want to check for lingering damage from the hotter months of the year before gearing of for rainstorms. Cracks have a tendency to retain standing water, and provide an access route for water to seep into your commercial roof’s inner workings, possibly damaging the insulation and cladding. This will result in costly repairs. The last thing you want for your commercial roof is mold caused by water damage from neglectful roof maintenance practices. If you find cracks or holes in your roof, try and have them repaired by a professional before rain comes. This repair will save you on any future repairs caused by water damage. After rainfall, check your commercial roof’s ventilation units, if they have any. You’ll want to ensure that they aren’t retaining water or that their systems have not been damaged or shorted by rainfall. While the temperatures may be cooler now, your ventilation units will be needed for the upcoming summer and need to be maintained during the rainy season. After a heavy rain, be sure to carry out an inspection of your ventilation units to check for water damage. While water damage is devastating, it is not often an overt thing. Water damage will strike subtly and over time. As such, you should check your roof even after a few days have passed since heavy rainfall. If water is still pooling an unusual amount, your roof may be susceptible to weakening and damage from water. Heavy pooling is also indicative of already existing damage on your roof. You’ll want to contact a roofing professional if you see these signs to inspect for damage and perform any needed repairs. For more information on commercial roofing practices, check out our site.